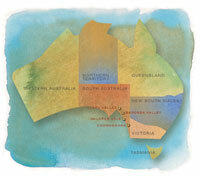 "Hunter Valley Semillon is Australia's unique gift to the wine world" Jancis Robinson MW - jancisrobinson.com. It might be one of Australia's smaller wine growing regions, but it can certainy hold its own on the international stage. Located in the state of New South Wales, this little wine region contributed to Australian winemaking history, in that it was one of the first wine regions to be planted in the early 19th century. There are now over 150 wineries in the Hunter region, producing excellent chardonnay, semillon, shiraz and cabernet merlot in particular. The close proximity to Sydney means Hunter Valley is a thriving little region for wine, food and tourism.